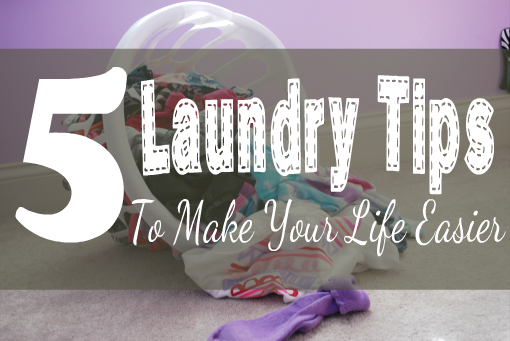 5 Laundry Tips to Make Life Easier! Nobody like to do laundry and if they say they do they are lying! I’m so thankful that I have this wonderful washing machine that does the hard work for me so I don’t have to do it by hand. I’m thankful for a dryer so I don’t have to hang my clothes out to dry. But anything that will make this chore even easier for me is welcomed. Here’s some laundry tips that will make your life easier! 1.Wash socks in a mesh laundry bag so they’re easier to pair up when folding. This tip is a life saver, especially if you have little kids. I don’t know where their little socks go but it seems like every load I’m missing 1 or 2. Find a mesh bag with a zipper top, I’ve gotten them at the dollar store before. Instead of just throwing the socks in our laundry bag put them in the mesh bag. Just throw the bag in the washing machine with the load. The socks will get washed just the same but they will all be there when you are done! 2.Soften clothes with vinegar. I use this tip all the time! I ditched the fancy fabric softener and just use vinegar. It helps to sanitize and soften clothes. Don’t worry, it doesn’t make your clothing smell like vinegar! Use about 1/4 cup per load. 3.Dry clothes in a jiffy by throwing a clean, dry towel in with wet laundry. This tip will help on those days where you have to do a dozen loads of laundry quick! Just toss and dry town in with your wet clothes in the dryer. 4. Dewrinkle clothes quickly with ice cubes. Throw a couple of ice cubes in your dryer with wrinkled clothing for about 15 minutes. As the heat from your dryer melts the ice cubes, steam is released to help rid your clothes of wrinkles. 5.Ball up aluminum foil and use it as a dryer sheet. Make a ball about the size of your fist and toss it in the dryer. It will help fluff up the clothes and reduce static. Plus it saves money because you can use them over and over again.